Haven't seen this in a while in our area. We have been touching up seed jobs this week. Haven't had to break up the soil in most lawns because the freezing and thawing cycles over the past few weeks have done it for us. 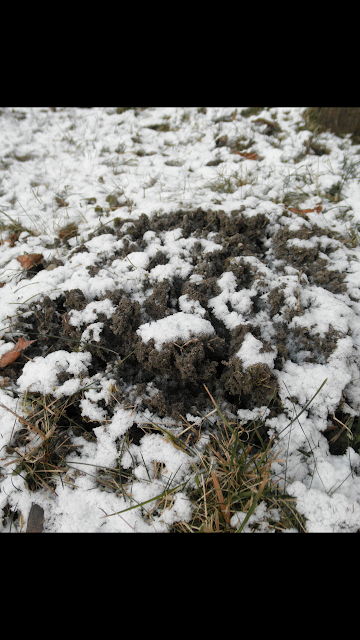 Basically, ice crystals form below soil surface and grow towards the direction of heat loss, and it almost looks like grub damage or skunk damage when they dig for grubs. The only real negative is immature seedlings from the fall seeding can be uprooted and killed. I will post some pictures tomorrow of a few dead seedlings. The good news is heaving soils make a decent seed bed! Seed we plant now will usually germinate by early March, but then again in TN it could be snowing or 85 in March! We will wait until new seedlings emerge before applying first application of preemergent on reseeded spots. What is needed for winter kill on hybrid Bermuda? I have found 3 consecutive days with single digit lows will cause significant death on hybrid Bermuda in two situations. If mowing height is one inch or lower or if an area gets lots of traffic, like between hash marks on football field.. The best case for preventing this is hopefully you applied potassium before the plant went dormant. Having at least an inch of snow cover prior to the temperature drops will also reduce winter kill significantly. zoysia can also experience winter kill, but has better cold tolerance than hybrid Bermuda, Common Bermuda is very hardy, so winter kill is rare on common!